"One Small Thing" exercise for "Buy In"
Would you like a predictable method for “Ahah!” Experiences? Are you looking for the essence of ongoing growth and change? Are you looking for one program which applies at every level of organization and at home as well as at work? The PRISMS/S Focusing Process (PDF: Proceso de Solucione de Problemas Prismas/s ), with its Core Skills of Intuitive Focusing and Focused Listening, allows “hunches” and “intuitions” to open into a spectrum of possibilities and “Ahah!” experiences. For individuals, PRISMS/S provides personal and spiritual growth, creativity, conflict resolution , and intimate relationship. For organizations, PRISMS/S provides the explicit “how to” for actualizing the goals of other approaches, such as Gladwell’s Blink Thinking, Goleman’s Emotional Intelligence, Total Quality Management, and Fish! Our Collaborative Edge Focusing Decision Making Method incorporates PRISMS/S into task-oriented groups for creative thinking, conflict resolution and win/win decision making. Through Creative Edge Focusing Pyramid, we provide seven self-help methods which allow PRISMS/S to be integrated into every level of problem solving, from personal to interpersonal to group/team to community to organizations. 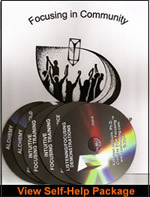 Focusing Self-Help Package: manual in English or Spanish, four CDs, two-hour DVD. If you want more help, you will find articles, books, manuals, audio- and video-tapes, CDs and DVDs in our Resources section. Dr. Kathy McGuire received the Ph.D. from University of Chicago, working directly with Dr. Eugene Gendlin, creator of Focusing (Focusing, Bantam, 1981, 1984. She has had a thirty-five year career as a psychotherapist and workshop leader and Certifying Coordinator for Gendlin's Focusing Institute.